We headed back to Malta’s sister island for a weekend getaway with our good friends here in Malta. If you follow me on Instagram, you would’ve seen my stories in real time as we traipsed around hopping from beach to beach with all the gorgeous views and wild roads in between! If you missed all that as it happened, don’t worry. I promise I’ll write up this weekend trip as soon as I can so you can see all the amazing things we saw. We had two weeks of fun with several friends visiting from Edinburgh, making August such a fun month! We had saved a few touristy things to do with them, plus we showed them around some of our favorite spots. We also chartered a sailboat for a day, which had to have made the Irish-Colombian‘s top 5 favorite days ever. The look on his face as our sailboat approached in the marina…you would’ve thought he was a kid who’d just seen Santa in the flesh! We also visited ancient temples and burial sites that truly blew my mind. Attempting to understand that these structures were built about 6,000 years ago is beyond my comprehension. To say I felt dwarfed and humbled by these incredible sites is an understatement. We did some snorkeling and scuba diving, moseyed around our neighborhood and explored some of Malta’s most popular sites. It is honestly one of my favorite experiences to have friends come to our expat homes so we can introduce them to our new lives! What I can announce now is that my Irish-Colombian is about to launch his own online business! He’s been offering 1-on-1 online personal training for a while now, but it’s growing into a full-fledged business. 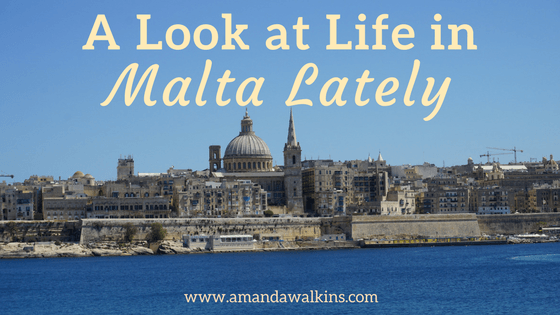 Things you can look forward to on the blog in the coming months include in-depth posts on my favorite spots in Malta so you can plan your visits accordingly. I’m also working on a comparison of Roatan and Malta, since both are very popular expat destinations with lots in common, but plenty more to differentiate them! I’ll have some logistics to share based on our experiences here in Malta with residency, housing, work, and utilities. Expat life can be full of questions, so instead of answering each of your questions individually by email, just know I’m working on these posts to help you out! I also have tons of drafts and partial posts I started back in Scotland and Ireland that just never made it to the blog. When (I purposely didn’t write “if” in an attempt at positive thinking!) I have the time to get those finished, you’ll get to hear more about our various day- and weekend-trips around both countries! Oh, and there was also that two-week trip I took through five European cities earlier this year that – again – never made it to the blog. So, yeah, basically, I have enough content to post every single day for the next year. But until (see that power of positive thinking again?!) this blog starts paying me more than my freelance clients do, it remains in the backseat of this writing train. Here’s to all the fun we’ve had and to all our big plans to come! Hopefully you’ll get to hear about them all right here, but be sure to stay in touch on social media for more updates in real time. Oh, hi! Are you new here? We’ve been expats in multiple countries, including Honduras, Scotland, and Ireland. We are currently living on the Mediterranean island of Malta. I try to post regularly, but frequently have these moments of “Oops! Sorry!” so patience is a virtue of my readers.